Aspirin has been a popular pain reliever and fever reducer for over a century. Its effect on the clotting mechanism of blood, however, has led to its widespread and often daily use in low dose form (81 mg) to help reduce the chances of heart attack or stroke in cardiovascular patients. While this has proven effective for many at risk for these conditions, it can complicate dental work. 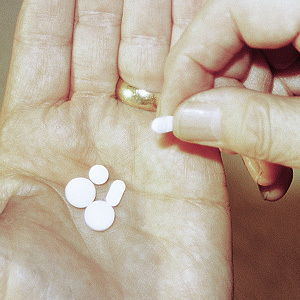 Aspirin relieves pain by blocking the formation of prostaglandins; these chemicals stimulate inflammation, the body’s protective response to trauma or disease. Aspirin reduces this inflammatory response, which in turn eases the pain and reduces fever. It also causes blood platelets to stop them from clumping together. This inhibits clotting, which for healthy individuals could result in abnormal bleeding but is beneficial to those at risk for heart attack or stroke by keeping blood moving freely through narrowed or damaged blood vessels. Even for individuals who benefit from regular aspirin therapy there are still risks for unwanted bleeding. Besides the danger it may pose during serious trauma or bleeding in the brain that could lead to a stroke, it can also complicate invasive medical procedures, including many in dentistry. For example, aspirin therapy could increase the rate and degree of bleeding during tooth extraction, root canal or other procedures that break the surface of soft tissue. Bleeding gums after brushing is most often a sign of periodontal (gum) disease. But if you’re on an aspirin regimen, gum bleeding could be a side effect. A thorough dental examination will be necessary to determine whether your medication or gum disease is the root cause. It’s important, then, to let us know if you’re regularly taking aspirin, including how often and at what dosage. This will help us make more accurate diagnoses of conditions in your mouth, and will enable us to take extra precautions for bleeding during any dental procedures you may undergo.